The film follows college sophomore Samantha (Jocelin Donahue). She lives in a dorm, but can’t stand her roommate. In order to get some money to rent an apartment, she answers a flier for a babysitter posted on campus. Her friend Megan (Greta Gerwig) gives her a ride out to the place, down a lonely country road, and we finally make it to the house of the title. Inside we meet Mr. Ulman, played by Hollywood veteran Tom Noonan. He’s been desperately searching not for a babysitter, as it turns out, but someone to be present in the house while he and his wife are out, in case there is an emergency involving his ailing mother in law, who is sequestered away somewhere upstairs. Ulman’s a creepy fellow. If Samantha didn’t need the cash so badly, she would have run screaming from the house right then. But then the movie would have ended, so good for us. Samantha is left alone in the house (except for the mysterious mother in law), and by this point in the film, there’s been little clue as to what is going on. One brutal spot of violence about halfway through is all the viewer gets for a long stretch to indicate that Samantha is in any danger. West set himself quite a task. The film is almost entirely a slow build to a frantic finale, and demands a lot of patience from a viewer. Handled poorly, it could have felt like sitting in the waiting room of a doctor’s office, but it’s just good enough. Thank goodness West has a talent for pacing and amorphous storytelling, because not only is there a good half hour in the middle with seemingly no script, there’s not even a plot. Regardless, this stretch is going to lose a lot of viewers. There’s just no way that some people aren’t going to regard it as fatal to the film. Eventually, West does reel it back in, and delivers a satisfying resolution. As for the cast, there was a marked separation between the pros and the ingénues. Noonan was joined by Mary Woronov and Dee Wallace. Their performances were effortless and good, even for Wallace, who had only a few minutes of screen time. Donahue and Gerwig, however, showed that there is something to be said for having decades of experience. They weren’t bad, just unpolished, and Gerwig showed that she could easily have been cast as the lead, probably to the film’s benefit. The House of the Devil is a deliberate film. For a horror flick, it sees no need to maintain a regular schedule of frights or gore, instead relying on its promise of a payoff at the end. In that it works. My only gripe is that if a film is not going to bring frights or gore, it cannot just abandon story for a large stretch in the middle. 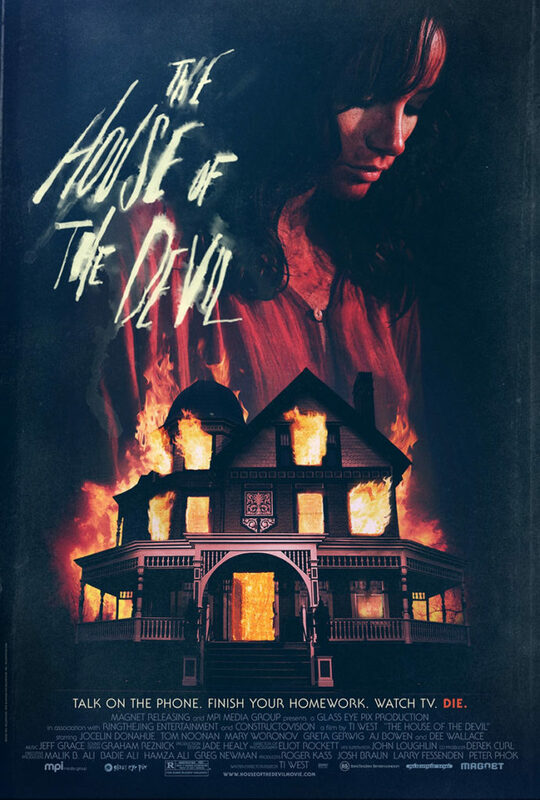 Far from perfect, The House of the Devil is a rewarding film, and worth seeking out.